50th and France restaurants promise a weekend upgrade. Red Cow’s special request breakfast poutine is a seasonal brunch favorite. Balance the savory with a sweet mini doughnut. Oh, what joy. In its own right, the point where 50th Street meets France Avenue operates as its own micro-city within the city of Edina. The brick-paved sidewalks, vintage movie theater and streetlamps wrapped year-round in twinkle lights are so well known that the multi-block destination doesn’t need a moniker; just call it by its intersecting street names and most Minnesota residents will nod their heads in familiarity. 50th and France is a decades-old destination for shopping, strolling, pampering and dining. There’s a grocery, a bank, spas, clothing, high-end condominiums and a diverse group of restaurants; so once you park your car, there’s really no reason to leave Edina’s longstanding pocket of charm. And this destination won’t fade anytime soon, thanks to its most recent multimillion dollar investment. The block between 50th Street and Market Street is currently undergoing a significant facelift that will bring a burst of new residences, an outdoor plaza, updated parking and fresh retail brands to the already bustling area. So what better place to get your go-to egg order and a crisp cocktail or cup of coffee next weekend? When you’re finished with your meal you can take a leisurely walk outside, pick up a gift for someone else–or one for yourself, grab whatever you forgot at the grocery store and pop in for an afternoon movie. We’ve rounded up some favorite brunches so you can map out your next month of Saturday and Sunday meals. When you think of Red Cow, one thing probably comes to mind: a burger any way you want it. So it’s a refreshing surprise to see a brunch menu that steers away from its single-track lunch and dinner and is diverse enough to have diners lining up every weekend. “We’re one of the few places with a flight of pancakes,” says Grant Fabel, assistant general manager of Red Cow 50th. “We have a gluten-free pancake [called a wild grain pancake] that doesn’t taste like it’s gluten-free,” he says. “And red velvet with peanut butter frosting and bacon infused syrup, and a berry pancake too.” Brunch begins with a complimentary mini donut before diners dive into dishes like chilaquiles Benedict with barbacoa and chipotle hollandaise or a decadent breakfast poutine that was a New Year’s special but can be ordered as a special request. “We’re really good with families and kids,” says Fabel. “But the brunch crowd is really fun because it evolves as the day goes on. I think people were yearning for a good hangout spot with quality food, and we’ve nailed down the ambiance for that.” This is a team who knows their customer and goes above and beyond to bring them back. In 2018, Red Cow placed second for service by The Growler magazine behind Manny’s and Spoon & Stable and was nominated for best brunch. There’s a strong beverage program, too, thanks to an eclectic selection of coffee and chocolate stouts and hazy IPAs, a bloody Maria with fresh beet juice and an apple cider shandy. 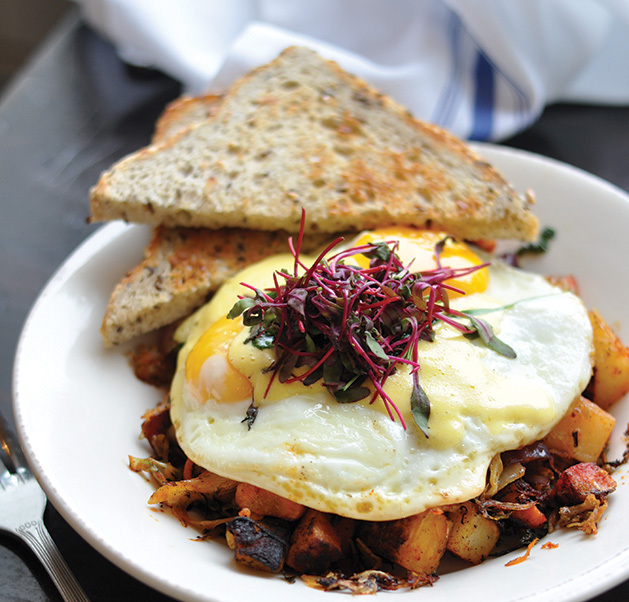 Loaded hash with pulled pork is just one way to start your day at Coalition where the focus is fresh, seasonal and local. The newest kid on the block; Coalition opened its doors a year and a half ago after finding success with its original location in Excelsior. 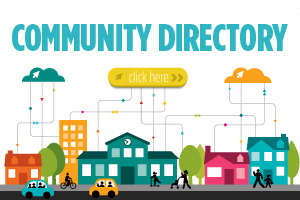 While there are many similarities between the two locales; the owners were intentional in creating choice distinctions. Where Excelsior is worn-in and charming; the Edina version is bright, modern and chic. A wall of stunning black and floral wallpaper greets diners before they walk up a few steps to a sleek bar, booth seating and a quiet back area that gives diners respite from noise. “Our focus is really farm to table,” says Aaron Kessler, social media manager for Coalition and its sister restaurant Red Sauce Rebellion and Rebel Bar in Excelsior. “That’s where our name comes from. We’re a coalition of farmers, growers, producers, cooks, bartenders and servers who work together to make a meal. And we’re open earlier than any restaurant here,” at 7 a.m. Monday through Friday and at 8 a.m. on Saturday and Sunday. The menu focuses on fresh, seasonal, local ingredients. And that intention is echoed in the most in-demand dishes. Diners regularly order the charred corn salad with lime vinaigrette and queso fresco; farro and arugula salad with balsamic; and seasonal pancakes–think pineapple upside down or triple berry. And there’s no better way to start your meal than with a round of bite-size cardamom sugar donuts and blood orange mimosas for the table. 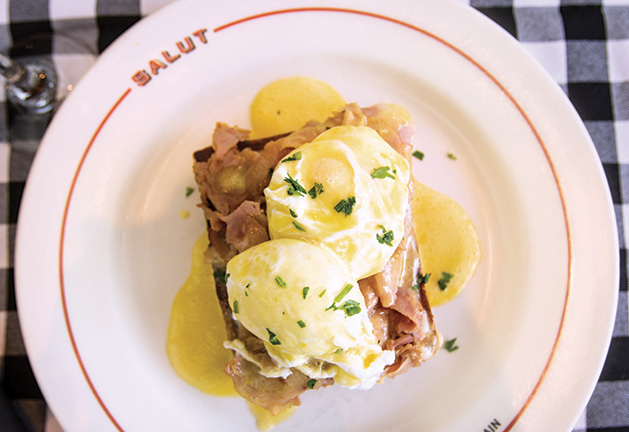 Try the “tres chic” eggs Benedict at Salut Bar Americain. Its buttery brioche is perfect for soaking up all of that delectable hollandaise sauce. Paul Angeles has been executive chef at Salut Edina for more than two years, but with the Parasole group for 13 years in total–including previous stints at the Edina and St. Paul Salut locations. “I wanted to breathe new life into the menu,” he says. “We elevated it but kept it approachable.” He created an indulgent braised short rib crepe with cured tomatoes, truffled creme fraiche and sunny-side up egg; as well as the crabcake a la grecque with avocado and tomato tzatziki sauce. In the mood for something sweet? Try one of their signature crepes, like banana Nutella or caramel apple with candied walnuts. “There are a wide variety of dishes,” says Angeles. “You can get something that sticks to your ribs or you can go light.” With an upgraded bar menu and cocktails like limoncello and bubbles, an espresso martini and a cold brew coffee Negroni, chances are you’ll find something very fancy and very French. Even their eggs Benedict dish is tres chic thanks to a buttery brioche that’s perfect for soaking up hollandaise.